Veeam Backup & Replication lets you restore linked clone VMs – VMs that were deployed from a VM template using the fast provisioning technology. There are several mechanisms for processing linked clone VMs. 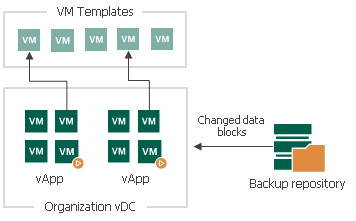 Veeam Backup & Replication uses the captured vApp metadata to define the initial settings of the VM. Veeam Backup & Replication calculates a signature for the consolidated VM disk in the backup file (containing the VM template data and data of the delta file) and the signature for the VM existing in vCloud Director. Veeam Backup & Replication then compares the disk signatures to define what data blocks have changed. Veeam Backup & Replication restores only changed data blocks from the backup file and writes them to the user delta file. Veeam Backup & Replication uses vCloud Director to create a new linked clone VM from the VM template that the user selects. The new VM has a blank user delta file. Veeam Backup & Replication calculates a signature for the consolidated VM disk in the backup file (containing the VM template data and data of the delta file) and the signature for the created VM in vCloud Director. Veeam Backup & Replication then compares the disk signatures to define what data blocks need to be restored. Veeam Backup & Replication restores only those data blocks that need to be restored from the backup file and writes them to the blank user delta file. By default, Veeam Backup & Replication links the VM to the same VM template that was used by the initial VM. During restore, Veeam Backup & Replication checks the settings of the VM template to which the restored VM is linked: verifies connection settings, makes sure the disk size coincide and so on. You have intentionally chosen to restore a linked clone VM as a regular VM. You are restoring a VM to the Organization vDC which has the fast provisioning option disabled. A VM template to which the restored VM should be linked is not accessible in the location to which the VM is restored. In this case, Veeam Backup & Replication uses the same algorithm as for restore of full VMs in the virtual environment. It retrieves the data of the consolidated VM disk from the backup file and restores the VM in the vCloud Director hierarchy.